2nd Annual Sheep and Goat Sale! Our focus on our small ruminants is low input- no deworming, no foot trimming, easy keeping, pasture improving stock that benefit and enhance our cattle and land enterprise. Our goats are predominately Kiko and Texmaster. The goats allow us to convert a expense into an asset. On many farms today it is a common practice to mow or chemically kill rose bushes, invading tree sprouts, and other noxious weeds. However our goats readily consume these plants. 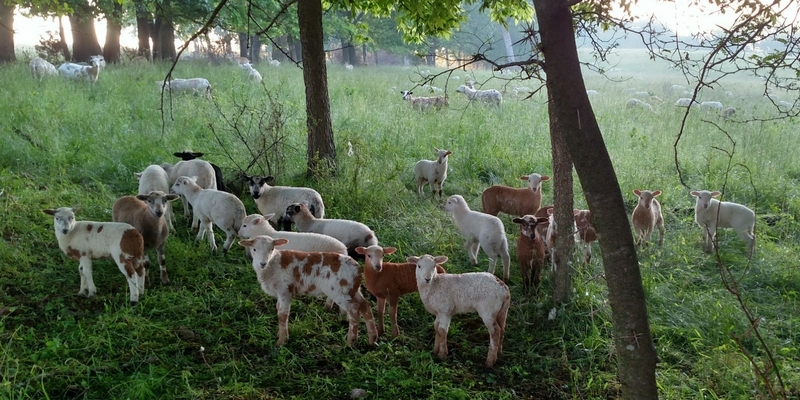 In fact, the goats favorite plant is the thorny locust tree (thorns can be up to six inches in length) and they will consume it before they ever take a bite of clover. 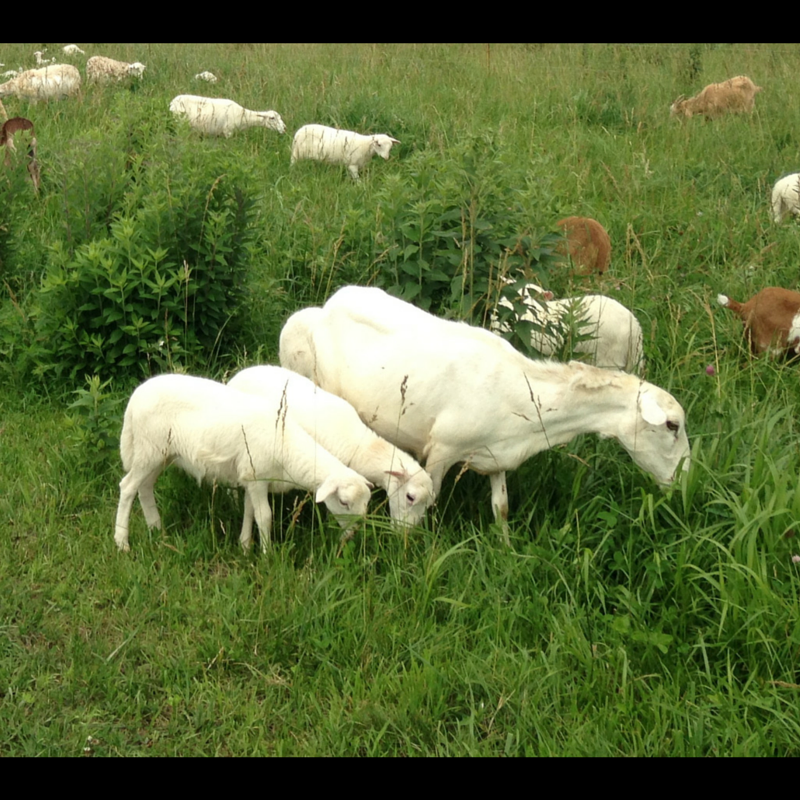 Therefore the goats allow us to convert these plants into fertilizer and meat, and they eliminate the need to chemically spray or mow our pastures. In addition, our goats provide us with endless entertainment with their gymnastics abilities. Currently we are undertaking a planned breeding program to fix several deficiencies in the goats. Those deficiencies are internal parasites and bad hooves. Many goats today require routine hoof trimming ( a lot of work) and chemical deworming in order to thrive. 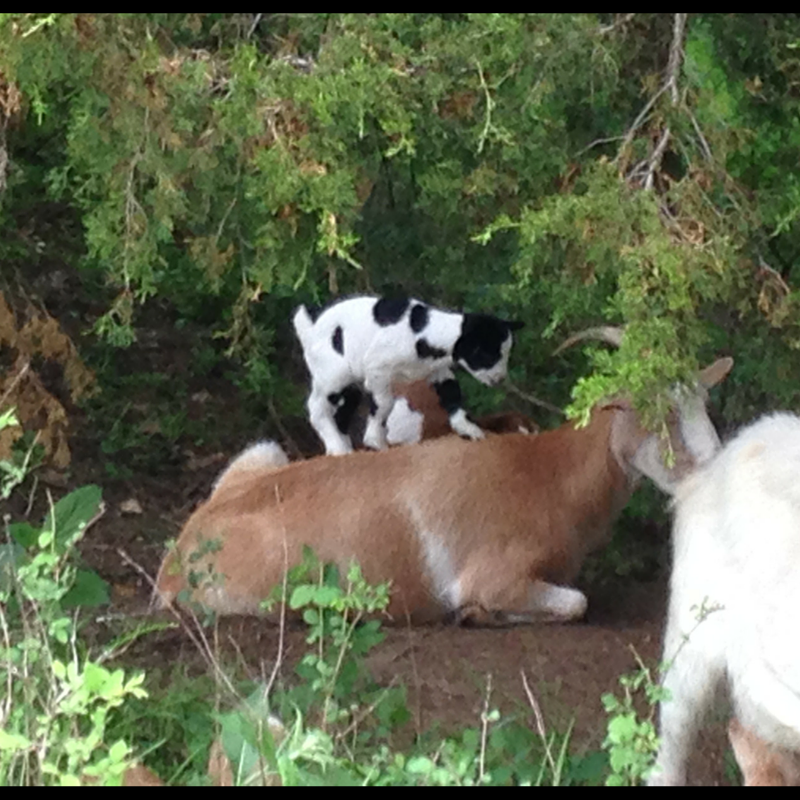 Our goat breeds are known for having better parasite tolerance and better hooves than most goats. However, we are attempting to produce a goat that never needs either of these expensive and time consuming amenities. We have made good progress so far and are very hopeful that we will succeed in our goal. For more information about purchasing breeding stock see the Join The Team page. We raise hair sheep that do not require foot trimming, are parasite tolerant, and do not need to be sheared. The sheep are what we like to call our cross over species. They will readily consume brush and other weeds like the goats but they can also do well on forage like the cattle. They are also more efficient than the cattle. A ewe (female sheep) can give birth to twins and wean them in five months at a weight heavier than her own ( a 100 pound ewe can have two lambs that weigh 55 pounds each five months after birth). A good cow will wean 50% of her body weight in six months. A ewe can also give birth within a year of her own birth ( born May 2015 she can give birth May 2016). Cattle give birth two years after they are born. For these reasons the sheep are the fastest growing livestock enterprise on the farm. See our Join The Team page for more information about purchasing sheep from us.